Make your first Google Analytics query (be sure to create an Account entry first). 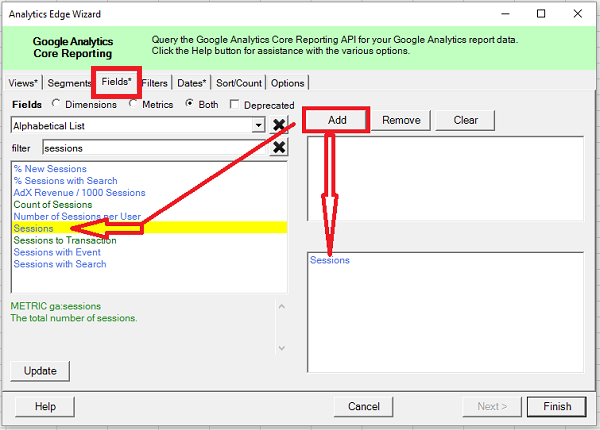 From the Analytics Edge ribbon, pick the Google Analytics > Analytics Reporting menu to open the query wizard. 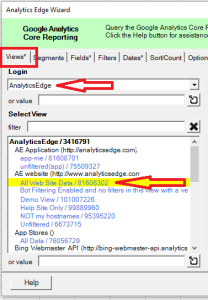 You must select a View, at least one metric Field, and a Date range for a valid query, and there are many other parameters available. On the Views tab, select a Login, then click the View you want to use — it will highlight in yellow, and information about the view will be displayed to the right. On the Fields tab, you must can select up to 7 dimensions and 10 metrics. Select the field you want, then click the Add button (or double-click on the field name) to add the field to the selected lists to the right. You can type in the filter box to find specific fields, and restrict the list to Dimension or Metrics by clicking the options at the top. Deprecated fields are ones that Google doesn’t want you to use any more, and they are hidden by default. On the Dates tab, select one of the Preset date ranges or use a combination of date options. Date ranges can be specified with a Start and End, Start and Duration, or Duration and End. Start and End dates can be selected from the date selectors, picked from a list of preset items (like Today or Last Month), or a value can be entered. 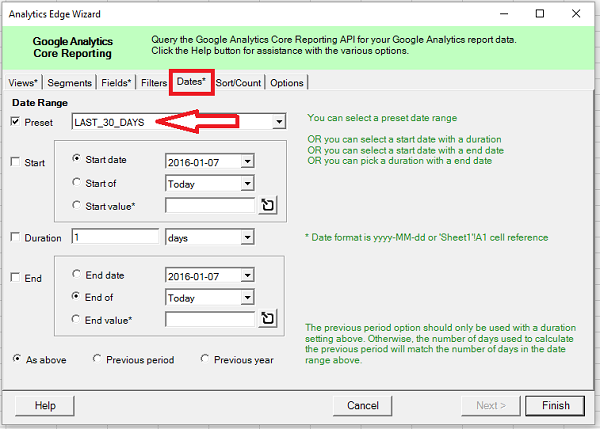 The button to the right of the value box can be used to create an Excel cell reference, so Analytics Edge will use the date in that cell when the query is refreshed. Click Finish to run your query. Note that the Finish button will be disabled if you have not selected a View, selected at least one metric, and picked a date range.